Maceration and micro-oxygenation are two important phases of the winemaking process linked to the content of the polyphenols in wine. What are the compounds that come into play in these two phases? The anthocyanins, which make up the pigments of red grapes, are extracted during the grape maceration phase, during alcoholic fermentation and, if it is expected, during post-fermentation maceration. The use of techniques such as pump overs and punch-downs favour their extraction. During the micro-oxygenation, through the action of oxygen, the anthocyanins bind to the tannins to form more stable adducts facilitating the stabilization of the colour of the wine. Tannins are relatively bulky phenolic polymers that derive from the polymerization reaction of phenolic monomers. They are able to combine stably with other vegetable polymers and with proteins. Their reaction with the glycoproteins which are present in saliva determines the sensation of astringency. 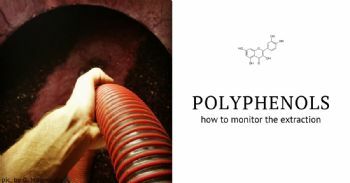 The determination of the polymerized anthocyanins is useful for the accurate monitoring of the micro-oxygenation phase. The HCl index is an indicator of the polymerization status of tannins and accounts for their evolution over time. Performing the analysis of total anthocyanins, tannins, polymerized anthocyanins and HCl index during micro-oxygenation allows to follow the evolution of colour stabilization for the whole process, thus supporting with objective data the sensory analysis. The complete panel of analysis for the determination of polyphenols greatly expands the possibilities of controlling the maceration and micro-oxygenation processes. How to manage at best maceration and micro-oxygenation in winemaking.